Investors, consumers, and business owners seem to be winning on all fronts these days. 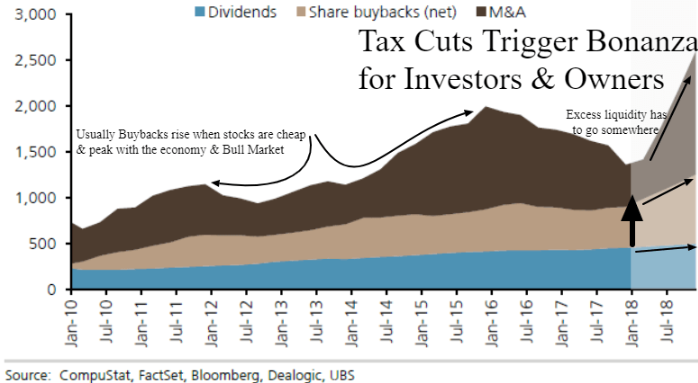 Forecasts estimate 2018 dividends of $500 billion, corporate stock buybacks of over $700 billion, and Mergers & Acquisitions (M&A) business of $1.3 trillion. This would be an impressive 10% of the value of the S&P 500 stock index and over 12% of the US economy (GDP). 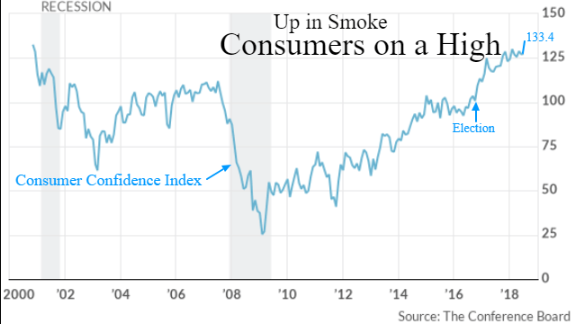 It appears a new surge in consumer, investor, and especially small business confidence has accelerated since the last Presidential election. Combining this momentum with new personal and business tax cuts, repatriation and deregulation in 2018, and it seems justified to expect a stronger economy that can withstand the global trade agreement uncertainty holding back peak spending. Despite elevated stock and real estate prices, there is a feeling that a new global investment surge could kick in if the major global economic engines settle their trade differences. The secular labor shortage has contributed immensely to the inability of the US economy to overheat with rapid inflation and surplus capacity building. The $124 trillion in corporate and consumer net worth currently dwarfs the $10 trillion in corresponding private debt accumulation. Politics and trade concerns may be heightened, but wallets are getting thicker. With more job openings than unemployed people available and debt service burdens and default rates near historical lows, the euphoria may be warranted. Stock bull markets don’t die of old age. The fact that this equity bull market is the longest and largest in history is not a reason to look for the exits. Real trade wars and credit tightening are the developments to watch that have yet to manifest. Equity bull markets typically go through 2.5 to 3 year phases where household net worth (real estate & stocks primarily) outpace income growth. We are a couple years into a new net-asset expansion phase today, thus exit signs for stocks become more important over the next year. With the sentiment and wealth surge amidst rising tension with China just before the mid-term elections, the odds of a short term corrective pause is growing.